In 1927, Paul Morand–a French diplomat and noted European author–made two extended trips to the Caribbean, Latin America and the American South. 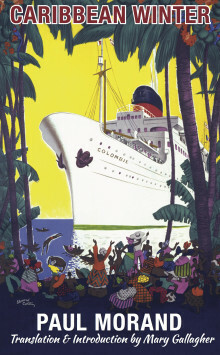 Published in 1929, his travel account begins as a diary about his experience of Venezuela, Curaçao, Guadeloupe, Martinique, Haiti, Trinidad, Jamaica and Cuba and ends with a lengthy essay on Mexico. Morand was already a prolific, cosmopolitan writer but he had not yet acquired his controversial post-war reputation. The stylish writing of Caribbean Winter fizzes with an acute intelligence and a rich–though sometimes elliptical–allusiveness (which is why this translation includes explanatory notes). It maps not just Morand’s vivid impressions but also his main preoccupations, particularly with the shifting place of Europe in the new world order. Although he avoids all direct mention of the ethnocidal clearing of the ‘New World’ or the African American slave-trade, he is obsessed by the perceived threats posed to Europe’s own future by mass migration and miscegenation. Morand was, above all, an uber-European and his work betrays the pseudo-scientific racialism of his time and background. Yet despite this blindness he was, at least, glimpsing the right questions to ask about the future of his world. And he knew that the Caribbean held most of the answers. He seems to have even intuited some of those answers and so parts of his commentary are startlingly modern and prescient. Much of Morand’s pre-war non-fiction seems to have warranted about seven decades of political quarantine. But the twenty-first century is gradually re-discovering its significance, both in French and in translation. Interestingly, while almost all of his work has by now made its way into English, this is the first translation–into any language–of Hiver caraïbe. Paul Morand (1888-1976) was the author of numerous novels, novellas and travel accounts. Mary Gallagher is Professor of French and Francophone Studies at University College Dublin.